Sometimes when I think of America, I imagine it as a large room containing 50 people, in where each person represents itself as a state. I imagine them talking to each other about their lives, their dreams, hopes, and revelations. Furthermore when I put the imaginary microscopic lens to each person, I see inside them, the very components that make them alive. The cities are the organs, the highways are the veins, and we, the citizens of each entity, represent the cells that travel around their bodies to keep them functioning each and every day. When I think about California as a person, I imagine that Sacramento is the heart that keeps this state thriving. Much like the heart in our human bodies, it is the epicenter of our survival. Our heart pumps life throughout our bodies much like Sacramento pumps life throughout California. In March I traveled to Sacramento to get a feeling for the town and its architecture. I conversed with the residents, learned about the vast and complex history of its creation and survival, and was given an incredibly detailed tour of the many landmarks that existed within the city. I returned back to my studio in San Francisco with my head heavy with dozens of facts, details, and historical components about this place. With that being said, my talent for editing was overpowered by the need to represent Sacramento and its history to its fullest, and this is where I ran with it. 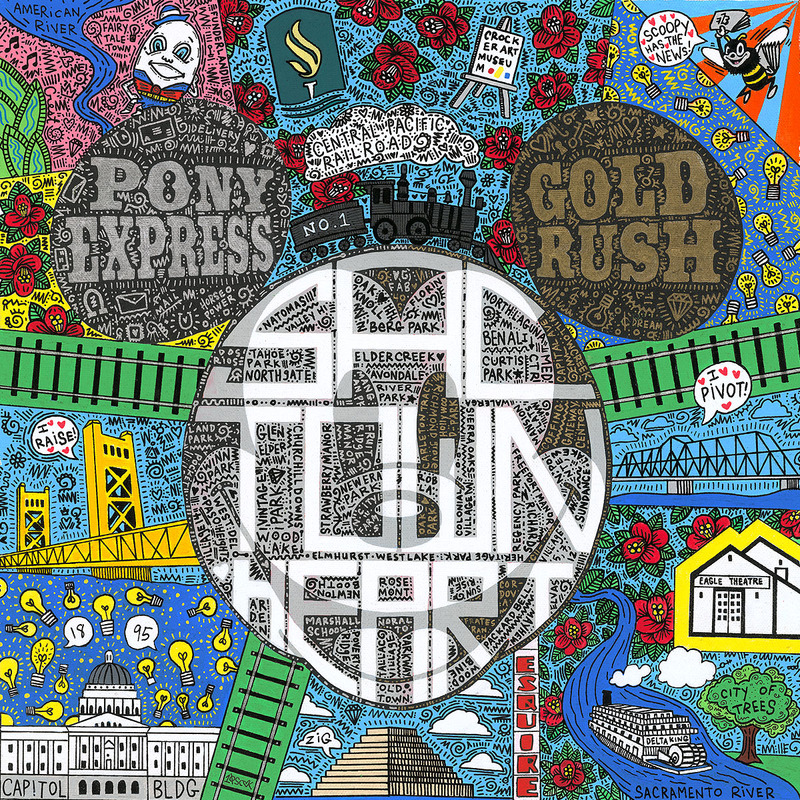 In piece, titled “Sactown Heart”, Mickey is viewed as the figurative heart of California. Inside his face I have put 70 of Sacramento’s districts that float around the title of the painting. In the ears I have labeled two historical events. The first one is the Pony Express, which was the vital mail service in 1860-1861 that existed as a west coast hub to solidify east-west communication before the invention of the telegraph. The second one is “Gold Rush” which commemorates the Californian gold rush era in between 1848 – 1855 which Sacramento played a huge part in. Since the background is a little complex, I’m going to break it down into sectors to fully describe what you are seeing. Overall: You will see Camellia flowers blooming all over this canvas. The Camellia is the city flower of Sacramento. Train tracks are blooming from Mickey’s head in all different directions to signify Sacramento as a transit hub for the Central Pacific Railroad. This hub is a central point for all trains to deliver supplies to the rest of the state and beyond. This also solidifies Mickey as the heart, and the train tracks as arteries to keep our state alive and well. Upper Left: The leaves and blue squiggles are deconstructed elements of the “Crest Theatre”. The word Crest borders on the circumference of the design. Humpty Dumpty, the exact mascot of Fairytale Town rests on the ear with the words “Fairytale Town” and “Funderland” next to it. These are two amusement parks for children in Sacramento. In between this is the American River. Middle Left: The tower bridge in shown here saying “I RAISE!” in representation that the bridge is a vertical lift bridge, and raises to let boats through. The tower bridge exists on the Sacramento river, and was opened on December 15th, 1935. Lower Left: The capitol building is displayed where with floating lightbulbs and two speech bubbles that say 1895. This is to represent the “Electric Carnival of Lights”, which happened on September 9th, 1895. This was to commemorate Sacramento’s achievement as the “greatest operative electrical plant on the American Continent”. In the late 1960’s, Walt Disney used the carnival as the historical model for Disneyland’s Electrical Parade which debuted on June 17th, 1972. Lower Middle: This is the Ziggurat building which rests next to the Sacramento river. In a speech bubble cloud, the building is saying its nickname “ZIG”. Next to it is the exact sign of the ESQUIRE building. Middle Right: The I-Street Bridge exists in this sector with a speech bubble that says “I PIVOT!” as this is a swing bridge that rotates out to let boats pass through. Built in 1911, the I-Street bridge rests on the Sacramento River. Upper Middle: The CP Huntington Train rides over Mickey’s crown here with the words “No.1” on the 1st car to represent that the train has “No.1” on it on the engine. Its emitting steam clouds with the words “Central Pacific Railroad” in it, as Sacramento was the HUB for the Central Pacific Railroad. Walt’s had a particular love for trains, and this engine exists as a copy at Disneyland. Camellia flowers bloom around The Sacramento State Logo as well as a canvas with the words “Crocker Art Museum” in it. Upper Right: Scoopy the Bee is depicted here flying in the upper right corner saying “Scoopy has the news!”. Scoopy the bee is the mascot for the newspaper in Sacramento called “The Sacramento Bee”. In 1943, Eleanor McClatchy, youngest daughter of C.K. McClatchy (and grand daughter of James McClatchy who founded the newspaper in 1853) offered to donate $1,500 to the army relief fund if Walt could develop a mascot that could “lend a personality and familiar identity” to The Sacramento Bee. Even though Walt was overwhelmed with war related work at the studio and not accepting outside commercial work, he agreed, and Scoopy was created. Overall this is probably one of the most complex pieces I have ever done, but I could not think of any other city to devote such details and history over than Sacramento. I should note that not only was this piece about Sacramento, but this piece is MADE of Sacramento. All the paint used in this piece was mixed with the water I bottled from the Sacramento River. This is the 4th piece of the Metropolitan Series, and 62nd in the collection.